communication for people with cognitive impairment. The book includes creative examples of mind maps on a wide range of topics. It also is very informative about neurocognitive degeneration and using visual thinking as a strategy for coping with its challenges. A great read! A remarkable book, full of wisdom, humor, and many, many, mind maps. 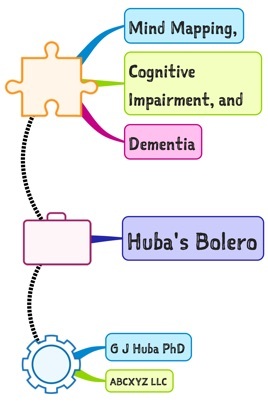 All of this aimed at a journey along the road of a neurodegenerative condition that is slowly robbing the author, George J. Huba, of his cognitive faculties. In response, the author has struck back at the condition by developing the strategy of living his life with the aid of mind mapping, a strategy that has allowed him to continue to write, blog, live, and share wisdom (mappingly) about life and his condition. This is without doubt the ultimate book on practical applications of mind mapping in the field of healthcare, and there is a lesson (and a mind map or two) in every chapter. Read it, and you will find yourself spontaneously mapping and returning to it again and again to answer "how did George do it?"